Blackbaud just released it’s 2011 Online Giving Report. Blackbaud analyzed trends around significant donations made online for the third consecutive year. 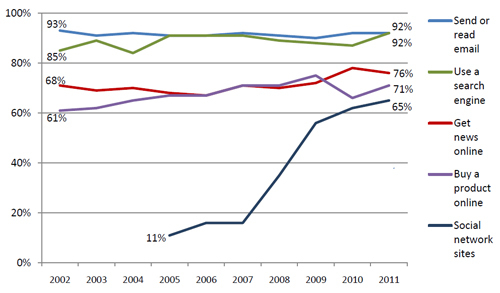 The online gifts of 2,397 organizations were reviewed to look trends for donations of $1,000 or more in 2011. 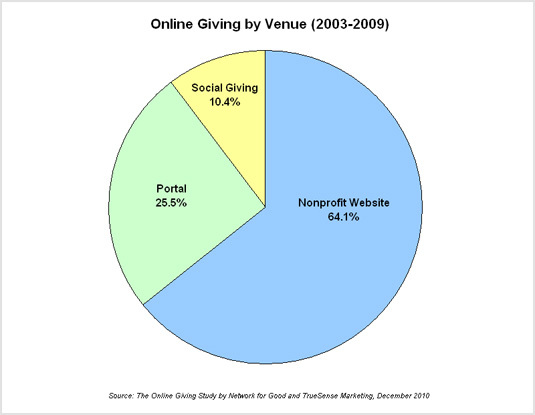 87% of the nonprofits in this analysis had at least one online gift of $1,000 or more during 2011. 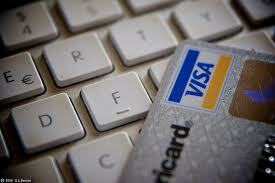 The largest online gift made in 2011 was $260,000. This was a significant increase from 2010, when the largest online gift was $100,000. 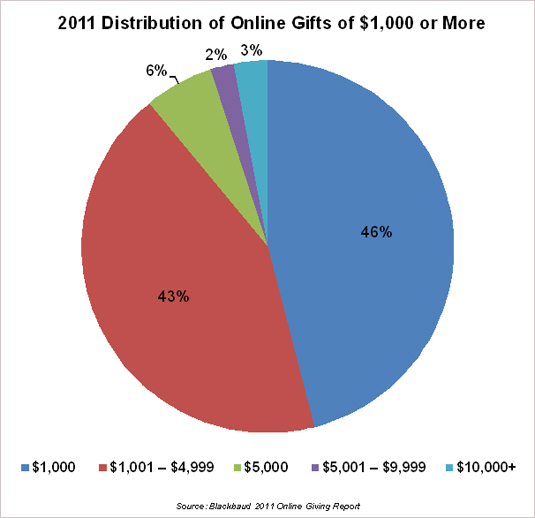 The median online gift of $1,000 or more was $1,200 in 2011. This was a slight decrease from 2010. Download the whole report from Blackbaud’s website. Between January 24, 2011 and February 10, 2011 NTEN, Common Knowledge, and Blackbaud surveyed 11,196 nonprofit professionals about their organization’s use of online social networks for the third annual Nonprofit Social Networking Benchmark Report. 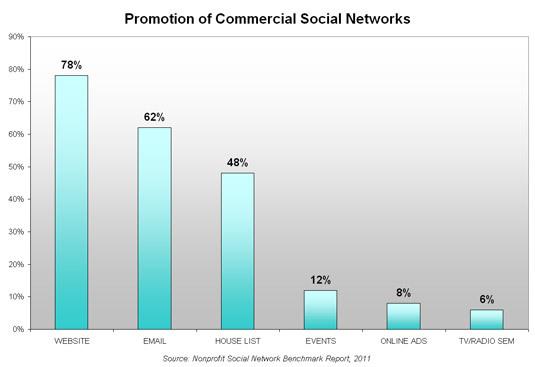 As we can see from the chart above the most popular channel for nonprofits to promote their commercial social network communities was the charity’s own website at 78%, next with 62% emails to their e-subscribers and while 48% used face-to-face events. Online advertisements and search engine marketing (SEM) are less popular, used by just 12% and 6% of groups respectively. How does your organization promote your social networks? Drop us a line and let us know! 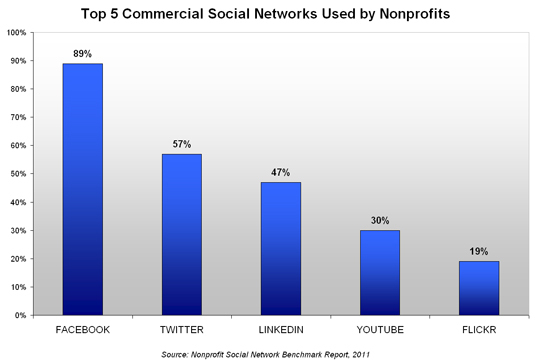 Heading in to 2011 most nonprofits (92%), regardless of organization size are using at least one commercial social network like Facebook,Twitter or LinkedIn. The industry giant, with 89% adoption among nonprofits is Facebook. Twitter is the second most popular, used by 57% of organizations, YouTube is third with 47%, LinkedIn claims the fourth spot with 30% and finally Flickr came in fifth with 19%. A survey released yesterday from the Pew Internet Project finds the two most popular internet activities are search and email; both are done by 92% of online adults in the United States. The second most popular activity was Get news online at 76%, third was Buy a product online at 71% and last Social network sites at 65%. The largetst gain in the last decidade was Social network sites from 11%-65%. This latest survey on search was conducted from April 26 through May 22, 2011 and had a sample of 2,277 adults, those 18 years and older. Cygnus Applied Research is releasing its 2011 Donor Survey this week. The 2011 Cygnus Donor Survey was conducted between February 7th and March 6th. Approximately 552,000 donors who made one or more gifts in 2010 and/or 2009 were invited to complete an online questionnaire. Over 22,000 donors responded from all over North America, including 17,605 from the United States. 83% of American donors who started the survey answered all questions, for a completion rate of 83%. The margin of error in this study is +/- 0.8%, nineteen times out of twenty. Donors prefer online communication to print. According to the survey, 69% of donors of all ages now prefer electronic over print communication. Donors are increasingly favoring online donations. Donors in every age category said they’d give online this year; 86% of young donors, 69% of donors between 35 and 64 and 53% of donors over 65. 26% said they plan to give less thru the mail this year, while 1% said they were going to give more via the mail. Also, according to the survey, 2011 will be the first year when a majority of donors in every age category will make at least one gift online. 31% of donors who prioritize giving online over other methods said that multiple forms of solicitation will not cause them to give more often or more generously, and an additional 49% said that soliciting them in ways other than online will actually persuade them to give less or stop giving altogether. Donors are becoming more concerned about fundraising costs. Cost-effectiveness is a major reason why online donors prefer online. Negative response to token gifts. 77% of respondents have recent experience (within the last two years) receiving token gifts. The overwhelming response was negative to questions concerning whether donors appreciated premiums. As well, 63% said they do not want to receive token gifts of any kind so that as much of their gift as possible goes to the purpose for which they gave. You can access the Executive Summary of the Report or purchase the full report here. Blackbaud just released it’s 2010 Online Giving Report. The 2010 Online Giving Report combines findings from The Blackbaud Index of Online Giving with additional multi-year giving data to provide the most comprehensive analysis of online giving trends in the nonprofit sector. The Report includes 24 months of online giving data from 1,812 nonprofit organizations from The Blackbaud Index of Online Giving, online major giving data from 2,190 nonprofits, and both online and offline data representing $5.1 billion in total fundraising from 1,438 nonprofits. 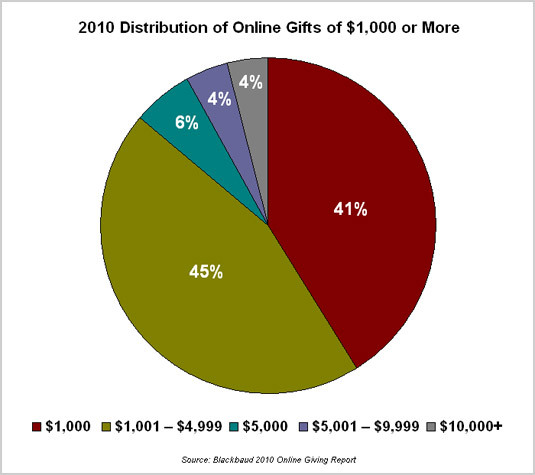 As we can see 86% of online gifts were between $1,000 – $4,999. The largest online gift made in 2010 was $100,000 and there were 10 gifts of this size. This was up from 2009, when the largest online gift was $60,000. The median online gift of $1,000 or more was $1,250. Online gifts of a significant amount are likely to increase and be a greater source of fundraising results for nonprofits. 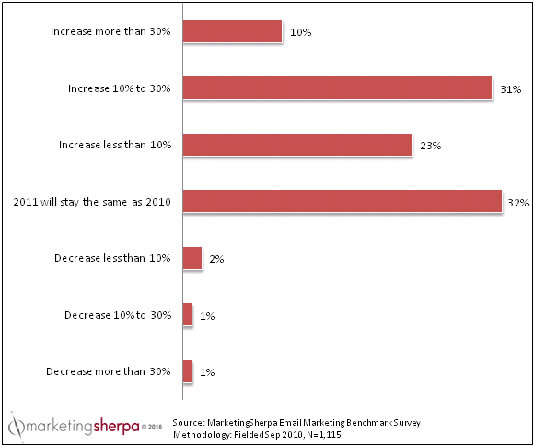 The chart below is provided by Jeff Rice, Research Analyst for Marketing Sherpa who survey 1,100 marketers on if their email marketing budgets will increase, decrease or stay the same for 2011. Judging by the chart above 96% of organizations email budgets will increase or stay the same, while only 4% of organizations plan to decrease their email budgets. For additional research data and insights about email marketing, download and read the free Executive Summary from the Marketing Sherpa 2011 Email Marketing Benchmark Report. If you think Internet users waste their day on their smart phones, ipads or computers a new study by, Pew Research Center’s Internet & American Life Project may surprise you. The study revels internet users are more likely to be active with some kind of volunteer organization or group. 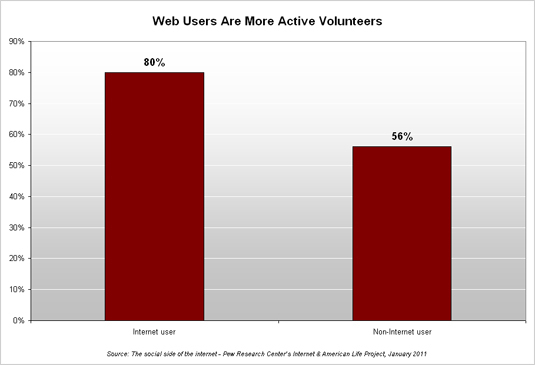 About 80 percent of Internet users participate in some sort of volunteer group, compared to 56 percent of non-Web users. The increased participation might be due to the fact that volunteer information is so readily available on the internet. Of the 2,303 adults surveyed by Pew, 72 percent of Web users said the Internet had a major impact on their ability to communicate with members. Another 68 percent said it greatly impacted efforts to draw attention to an issue. Download the whole report from Pew Research Center’s Internet & American Life Project’s website. Below is a chart from “The Online Giving Study” conducted by Network for Good and TrueSense Marketing. It examines the online giving experience not only on nonprofits’ websites, but also via donation portals and social networks. As we can see that more than half of charitable online giving through Network for Good is via the charities website (64.1%) followed by giving portals (25.5%) and social networks (10.4%).